Perhaps the best way to recognize just how good “Blade Runner 2049” is would be to acknowledge what it's not. It's not a carbon copy of Ridley Scott's original “Blade Runner” (1982). In fact, it's not even preoccupied with reminding us it's a “Blade Runner” movie, and although it's a sequel, it's not reliant on the original to be understood and effective. It's not heavier on action than it is on substance, but it doesn't cut corners with regards to its production values. It's doesn't rush through its story or feel impatient, yet it's not slow or dull. And despite its star power, it's not merely a showcase for the cast. The reason I mention what the film is not is because so many Hollywood sequels tend to be inferior renditions of their originals, especially ones made so long after the fact. They're often bigger, louder and more ostentatious, yet less substantive and effectual. 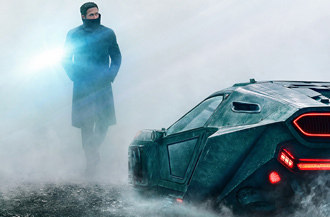 Not “Blade Runner 2049.” This is a full-blooded, confident, self-contained experience, with mesmerizing visuals and sounds and a surprising amount of depth and humanity. It's a movie so striking and layered it practically asks us to see it twice, a request to which we'd gladly submit. As the title indicates, the story takes place in 2049, 30 years after the original, and humans still occupy the same dark, dreary, dystopian world where they've exhausted Earth's resources and rely on bioengineered robots knowns as “replicants,” or “skin jobs,” for their superior strength and agility, albeit deliberately limited intelligence. If you recall from the first film, the Tyrell Corporation first invented replicants, which are virtually human save for their lack of emotions, in order to explore and colonize Off-world planets. Replicants were essentially slaves and it was only after a replicant mutiny took place that they became illegal. It's the job of special police squads, known as “blade runners,” to “retire” replicants. Now, however, a new, obedient replicant model exists, some of which serve as blade runners themselves. One of these is K (Ryan Gosling), who's been tracking members of the replicant freedom movement, who believe all replicants should be liberated rather than hunted. K's latest assignment leads him to a remote farm outside of Los Angeles, where one older replicant (Dave Bautista) protects the buried remains of a female replicant that actually gave birth several years ago, which was long thought to be impossible, but this “miracle” serves as the freedom movement's strong push to fight for their rights as living beings (“We are our own masters; we are more human than humans”). Upon learning of this birth phenomenon, K's superior, Lieutenant Joshi (Robin Wright), orders him to destroy all evidence of it because news of a human-replicant offspring could lead to chaos and unrest. But K remains curious and he takes it upon himself, with the help of his trusted holographic girlfriend, Joi (Ana de Armas), to look into the identity of the replicant mother and human father. Without giving away crucial plot details, K unearths a disturbing history involving veteran blade runner Rick Deckard (Harrison Ford) while simultaneously examining his own potential humanity and existence.